Effective customer incentives lead to customer satisfaction, if they are thought out and provide something that customers perceive as valuable to them. Unfortunately, many organizations create incentive programs that their marketing team feels would offer value. Such stimulants are often provided without asking customers what they would like to have. While such offerings might look good on a window banner or in a commercial, they often have little meaning for many customers. If you scan local businesses for the discounts and inducements available, you will likely find some organizations offering little or nothing ,while others provide a variety of options. The good news is that many organizations offer some type of incentive to try to entice customers to do business with them. The bad news is that they often waste money and marketing effort because they provide the wrong types of incentives. While effective customer incentives lead to customer satisfaction, you should remember that customers must perceive value from them if they are to work. Most customers prefer to have something that really addresses their wants and needs; not what marketers decide that they should have. The following are typical motivators that various companies offer in an effort to gain new customers and to get people to buy the organization’s products or services. As you will read, efforts to provide encouragement to customers often has the opposite impact. 2 for 1 specials or buy one, get one free offers. If you have ever received mail or newspaper flyers offering these types of stimulants you know that they can potentially be ineffective. For example, buy one hamburger or meal and get a second one free. If you have someone with whom you can share the offer, then you may be motivated to buy. Unfortunately, this type of come-on is often useless to a single person or someone on a diet, since there is little incentive to buy. A more effective approach might be to offer this deal and also offer an option of buy only one meal at a reduced price. Buy 2, get 1 free. Many supermarkets offer this type of incentive. The challenge again is that people desiring to make bulk purchases may not be encouraged to take advantage of the offer. Especially, if the products are perishable food. Coupon for money off a product when purchasing two or more of an item. Similar to the last option, food manufacturers are now using this type of deal. Many people routinely cut and used discount coupons from the Sunday paper. In today’s digital marketplace, where coupons can also be accessed via smart phones and other devices, this multi-item enticement is less attractive to many people. This is because many coupons are now only valid if consumers buy multiple items. Additionally, the discounts offered are still around the same level that they used to be for the purchase of a single item. Offer for money off the retail price of an item. An effective way to get people to buy something is often to offer a set currency amount or a percentage off the purchase price of an item. Clothing, department, sporting goods and other types of stores often take this path to discounting. By making the discount a perceived value to customers (e.g. 25% off) or putting a minimum purchase amount (e.g. $50.00), sales often increase. Free oil change when first visiting a car repair facility. Depending on the type of oil and filter being offered, this might appeal to some customers. A repair facility using this approach might want to add the option of a discounted price for those who prefer premium oil or a name brand filter. This can help attract a higher tier of customers who might be able to afford additional premium services on their vehicles. $1,000 rebate or no/reduced finance charge for 36 months. Many new car dealerships now offer several financial-related options from which a customer might choose. Since most people appreciate the opportunity to save money, this approach often appeals to many car buyers. In effect, this choice of incentives puts the customer in control of what he or she gets. Another type of incentive related to car buying is to offer a low down payment option. This inducement reduces out-of-pocket expenditure. It often appeals to many customers in a tight economic market and for money conscious and entry level car buyers. Online basket abandonment offers. Many online retailers now offer an emailed discount offer when customers abandon their shopping cart with items in it before completing a transaction. For this type of situation, many consumers will later opt to go back and make the purchase in exchange for an offer of a discount. Email opt-in offers. In a world where email in-boxes are overflowing, it is often difficult to get people to provide their email address unless there is some type of financial enticement. A 2014 BlueHornet Networks, Inc survey, revealed that the top reason for giving up an email address is a discount. For consumers in the 18-45 years old bracket a percentage off offer persuades an email surrender, and for the 46-75 year old group, it was free shipping. No matter what type of organization you have or for which you work, customer incentives lead to customer satisfaction. The key is determining your customer base, what they perceive as important, and then offering something to satisfy their needs, wants and expectations. For additional ideas on customer satisfaction strategies, search this website for other articles on the topic. 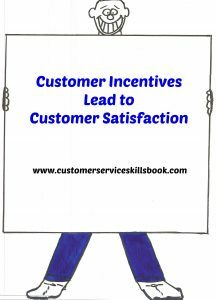 In what ways do customer incentives lead to customer satisfaction in your organization or those that you patronize? Please share those with other readers. This entry was posted in customer expectations, customer retention, customer satisfaction and tagged customer incentives, Customer Incentives Lead to Customer Satisfaction, customer satisfaction incentives. Bookmark the permalink.